Custom Pantone matched knee high Socks - great for schools or awareness marches! 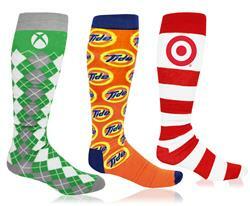 Our Pantone matched knee high socks are sure to be a hit for your brand. Choose up to 3 PMS colors (6 total colors) for your knit-in jacquard design; plus mix and match any of our add-ons to your socks. Each pair of socks is woven together from scratch, with your logo and design seamlessly weaved together to create a design that is uniquely yours! 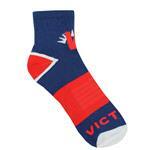 A new addition to our promotional sock line. One Size Fits All, with the calf of the sock measuring 14.5” heigh. Material: 80% Cotton, 15% Nylon, 5% Spandex. Imprint Type: Knit-in Jacquard or Embroidery. Imprint Locations: Anywhere on the body of the sock. We don’t recommend printing on the cuff,toe or heel.